One of the challenges of financial advisor marketing is developing effective messaging that stays within the bounds of federal regulations governing advertising content. One such regulation limiting the use of testimonials in financial advisor advertising represents a significant handicap, because testimonials are used to build trust, and trustworthiness is the most important consideration in choosing a financial advisor. Trust also plays a role in where people go for information when seeking an advisor. The fact that most new business comes from referrals isn’t an accident. Friends, family members, and colleagues consistently rank near the top in studies examining trust in sources of information. But even referrals have a weakness. Their reach is limited by both the size of the advisor’s professional network and the fact that they occur almost exclusively through one-to-one communication. So it follows that improving on what’s worked best in the industry to this point is a matter of delivering the message that an advisor or firm is trustworthy via a trusted, one-to-many source with expanded reach, all while remaining compliant to the applicable rules. It may sound complicated, but it’s as simple as encouraging clients to write a review, preferably on Google. If I know my audience, the biggest doubt about financial advisor reviews will be around the issue of compliance, so let’s clear that hurdle before addressing how and why this approach has so much potential. Section 206(4) of the Investment Advisers Act of 1940 generally prohibits any investment adviser from engaging in any act, practice or course of business that the Commission, by rule, defines as fraudulent, deceptive or manipulative. When a client writes and publishes a Google review, they are the publisher and Google, not the advisor, is the owner and administrator of the means of publication. I’ll provide some additional details on compliance that may be helpful to advisors that decide to take advantage of the opportunity, but what’s important to know at this point is, as long as the advisor doesn’t make themselves a publisher by compensating a reviewer or authoring and/or posting anything – including responses to reviews – they will not be in violation of the testimonial rule1. As mentioned earlier, financial advisors’ biggest source of new clients is referral, a fact that research consistently verifies. It stands to reason, then, that when I ask my clients why they have a website, the most common response is to provide information about their services, background, and experience to prospects that have been referred to them. An advisor website can, and should, do much more than that, but at this juncture, for most firms, the primary purpose of their website is as a kind of online brochure. And that’s not necessarily a bad place to start, because 80 to 95 percent of consumers conduct online research before making a purchase decision. average of 79 days gathering information before pulling the trigger. So we now know that new business most-often comes from referrals, that most people use the internet to research the advisor(s), and that they probably spend a good bit of time doing it. Where do you think they start their online research? Unless the prospect has the firm’s Web address in-hand, and they’re only interested in hearing about the advisor from the advisor, it’s safe to say that they’re going to start with Google. And there’s data to support that. According to a 2017 report by Forrester Research, 71 percent of consumers start their path to purchase with a search engine. The image above depicts the Google search results pages (SERP) returned when I conducted searches for two firms near my office by name. (identifiable information is redacted to avoid promoting or shaming any particular firm or advisor). 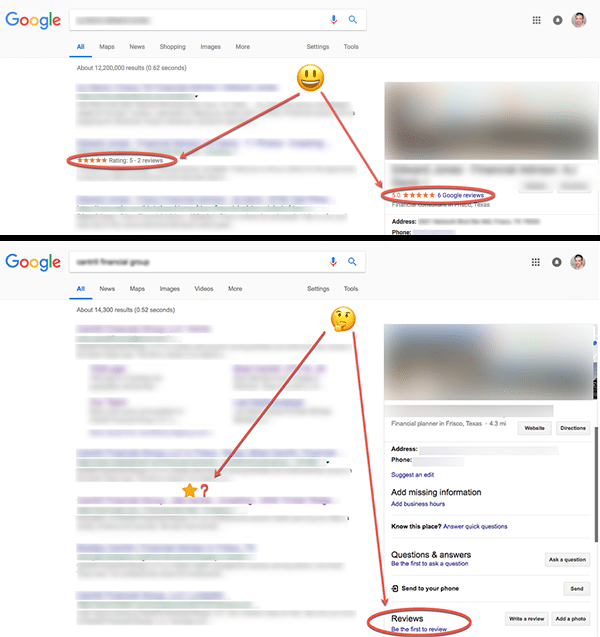 The top image shows results for an advisor with six reviews on Google and two on Yelp (left-, and the bottom one shows results for an advisor with no Google or Yelp reviews. Put yourself in the shoes of the prospect. Did those stars draw your eye? Would you click and read those reviews? Would you be more comfortable with one advisor over the other? Who would you be more excited to work with? Research indicates that most prospects would click and read the reviews, and seeing as this advisor has high average (star) ratings, they would likely feel much more confident about the advisor with reviews. So how do consumers feel about reviews? roughly eight-in-ten American adults (82%) consult online ratings and reviews when making a first-time purchase. forty percent of Americans (and around half of those under 50) indicate that they nearly always turn to online reviews when buying something new. nearly half of Americans feel that customer reviews help “a lot” to make consumers feel confident about their purchases (46%) and to make companies more accountable to their customers (45%). And here’s the kicker: according to a 2017 eMarketer report, online reviewers have overtaken friends, family and colleagues as the most trusted source of product information. Does that mean that financial advisor reviews are the new referral? Things are certainly heading in that direction; but referral or no referral, the firms that take this opportunity seriously will undoubtedly reap the rewards. While referrals and branded search (e.g. “John Doe, CFP or “Doe Financial Management”) may be the most common way to use Google to aid in selecting a financial advisor, non-branded queries (e.g. “financial advisor in Frisco TX,”) are an important source of leads that will experience growth if the trend indicated by that eMarketer survey continues. As such, it wouldn’t surprise me if many prospects – especially younger ones – start to skip the referral altogether. And when that happens, advisors who have amassed a solid collection of reviews will be well positioned, because Google reviews also improve search ranking for all location-based queries. According to the 2017 Local Search Ranking Factors Survey conducted by highly respected SEO authority MOZ a combination of quantity, velocity, and diversity of Google reviews is predictive of higher ranking, and a greater number of clicks, which also improves ranking. In digital marketing, it’s incredibly rare to come across a high-yield, low-competition opportunity. Typically, anything that can be exploited will be…and then some; but what we’ve got here is the closest I’ve seen in some time. To get a feel for just how green the financial advisor review field is, I searched “financial advisors in Frisco TX” using Google’s map interface, which shows how many Google reviews each listing has. Of the fifty listings I looked at, five (10%) had one or more review. Of those five, two firms had one review, one firm had two reviews, one had six and one had twenty reviews. AGranted, this isn’t the most scientific approach, but when I repeated the experiment in other geographic areas, the results were all similar to the one described above – including some in which none of the firms had a single review. SEO doesn’t happen overnight, established players are difficult to unseat, and you can expect unbranded searches to become a bigger source of leads over time, so getting a jump on the competition is likely to pay dividends. Because they’re triggered by a search query and are native to the search engine, Google reviews are most likely to present themselves along the buyer’s journey where they have the most impact. assuming that the MOST advisors do is ask clients to review them on Google, all indications are that they will not be violating any SEC regulations (more on other sites below). After Google, Yelp reviews seem to have the most potential to appear in search results, and there doesn’t appear to be anything about it that would present compliance issues. As far as I know, Facebook and Angie’s List are OK too, but at this point, they are of an unknown to me in terms of risk and potential reward. It appears that an advisor can be in violation of the testimonial rule simply be being reviewed on LinkedIn, due to the fact that account owners have the ability to suppress individual reviews and ratings, so of all the well-known sites, that’s the one I would not seek, or even allow, reviews on. I plan to discuss this one in greater detail after further research, but at this juncture, asking clients (verbally) seems to be the safest bet. One post I read suggests placing the request in email signatures or keeping an iPad dedicated to collecting reviews in the reception area. It also seems that blasting an email out to current clients would be effective, but out of an abundance of caution, I’m going to hold off on recommending anything but simply making the request on the phone or in-person. Clients, former clients, prospects, etc. don’t need the advisor’s permission to write and publish a review, and responding to, editing or suppressing a review is a violation of the testimonial rule. Given that, the best thing an advisor can do is request reviews from their clients. That way, if one or two bad ones do pop up, they won’t obliterate their average rating, which, as you can see in those screenshots, is quite visible in the SERP. Re-publish Google reviews to their website or social media accounts. While doing so is allowed under certain conditions, the number of restrictions placed on doing so create an unacceptable level of risk in my view. As an aside, I’m investigating a technical solution that would reduce the risk to an acceptable level, so there may be more on that in the future. Hopefully, I have gotten you as excited about this new opportunity as I am. I’ve done my best to present the facts in a clear and concise manner with all the supporting research, but if anything is unclear or if you have any questions or input, please don’t hesitate to get in touch or leave a comment. I would love to hear about the experiences of those who have instituted a review strategy in particular. 1: The content contained in this blog post, and throughout this website, is the result of my own interpretation of the information I have reviewed, and wherever possible, I have provided links to source documents. I am a marketer who specializes in financial services and financial advisors. I am not an attorney, a compliance expert, or a financial advisor and the information I have provided here does not constitute, and should not be considered legal advice. Wherever applicable, and especially in regard to issues of regulatory compliance, financial advisors and/or others viewing the content herein should consult the appropriate authorities, including, but not limited to, the Securities and Exchange Commission, attorneys or designated compliance experts.